Driving along Snake Road, on the north shore of Geneva Lake, one can see why it has earned its place as a state-designated “rustic road.” Its curving route and gated estates are undisturbed by storefronts or signs. 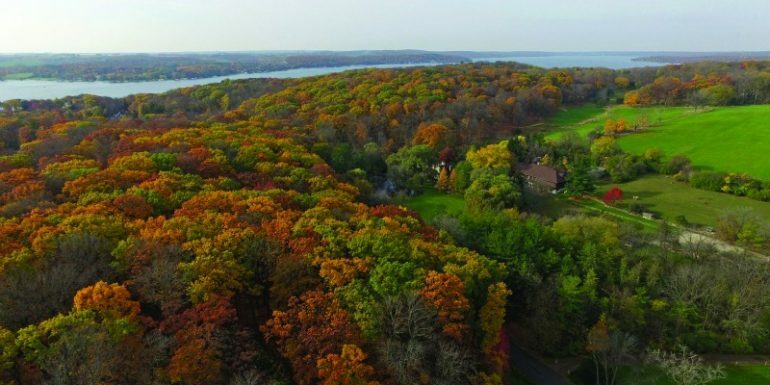 It is a sanctuary amidst the growing development of Lake Geneva, preserved by generations of families who have kept this portion of the lake quiet and contained. Driving, walking or biking on Snake Road is like going back in time to an era when steamboats and elaborate “summer cottages” first dotted Geneva Lake. The legendary families of Snake Road came to Lake Geneva for two main reasons: The Great Chicago Fire and the railroad. When most of Chicago burned to the ground in 1871, it seemed almost fated that the Chicago & North Western Railway would reach Lake Geneva earlier that same year. 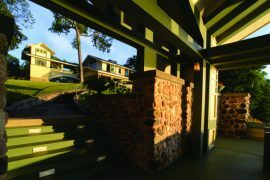 Many Chicagoans needed a place to stay while their homes were being rebuilt, and Lake Geneva provided a quiet retreat. The train brought men like Harry G. Selfridge and Charles H. Wacker to the lake, along with the influential families of Snake Road. 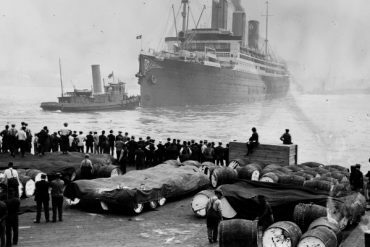 And so began the “Newport of the West” era, roughly 1870-1920, when Lake Geneva attracted Chicago’s richest families and most daring entrepreneurs. One of the most extraordinary men to live on Snake Road during this time was Mr. Charles L. Hutchinson. Although his name may not sound familiar, he was famous in his day. Hutchinson’s family founded the Corn Exchange Bank (later Bank of America), and he served as president of the Chicago Board of Trade. In his spare time, Hutchinson helped to create, finance, and curate the Art Institute of Chicago. At Lake Geneva, though, he was just a gardener. 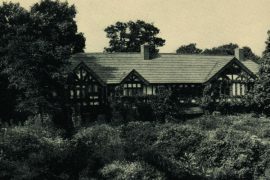 He and his wife, Frances Kinsley Hutchinson, lived on Snake Road in an estate called Wychwood, named after the witch hazel growing on the property. They dedicated thirty years to developing a wild flower sanctuary on their property, and ultimately donated the land to the University of Chicago. They were part of the most elite social circles, yet in Wisconsin they spent most of their time cultivating their gardens and extensive property and enjoying the company of their pet sparrow. Growing up, Hutchinson lived with a great deal of privilege, but his father didn’t believe in coddling. Charles was sent to Chicago’s only public high school and put to work immediately after graduation. (He asked to go to college at Harvard or Yale, but his father thought it was a waste of money.) So, Charles entered the family business in 1872 and was an immediate success in the banking industry. Outside of work, he maintained passionate interests in art and education. Hutchinson is most often remembered as the “father” of the Art Institute, which he founded with the help of his Lake Geneva neighbor, Martin A. Ryerson. Both Ryerson and Hutchinson were happily married with no children, had deep financial pockets, and loved art. Whenever possible, the Hutchinsons and Ryersons traveled the world in search of art to purchase. Some of the art went to their personal collections, but most went to the Art Institute. In fact, it was Ryerson’s personal friendships with artists like Monet, Renoir, and Mary Cassatt that brought such avant-garde works to the museum. Monet even visited Ryerson at Lake Geneva, bringing yet another legend to Snake Road. Hutchinson was a true philanthropist and insisted the museum did not charge admission on Sundays, when most workers had the day off. He personally walked the halls every day, greeting guests and staff. As his obituary stated, Hutchinson’s devotion to the Institute was “so complete that it is not possible to measure it. He was the Art Institute.” In his will, Hutchinson left twenty paintings and $95,000 to the Institute (over $1.3 million in 2016). It was his greatest joy and life-long obsession. But he didn’t stop there. Charles Hutchinson was also the treasurer of Jane Addams’ Hull-House (a settlement house for European immigrants), where he brought over a dozen turkeys every Thanksgiving. He served as president of the Chicago Orphan Asylum and director of the Chicago Public Library. He joined several Lake Geneva neighbors (including A. C. Bartlett of Snake Road) in supporting the University of Chicago, which still includes a building that bears the name Hutchinson Hall. Although he never went to college, Hutchinson earned an honorary degree from Harvard University in 1915. Later, he was granted a knighthood for his relief efforts during World War I. It’s as though Hutchinson never slept. Lake Geneva was an escape for the Hutchinsons, but they never tired of civic duty. Mr. Hutchinson built Lake Geneva’s Horticultural Hall and founded the Gardener’s and Foremen’s Association, which later became the Lake Geneva Garden Club. His wife was extremely active in the latter organization, and there is still a Frances K. Hutchinson award given out by the Garden Club of America for efforts in preservation. The couple also helped to start Lake Geneva Country Club. Here, Hutchinson could hatch plans with Ryerson, Bartlett, and other “lake friends” to build museums or fund schools, all between rounds of golf. Two houses down from the Hutchinsons was the estate of Norman Wait Harris, whose home is known as Wadsworth Hall, and today is owned by Richard H. Driehaus. Hutchinson and Harris traveled in the same circles, especially as trustees for the University of Chicago. Harris was a more reserved man, but he gave Hutchinson a run for his money as the most active philanthropist on the lake. Norman Harris started out in the insurance business in Cincinnati, where he worked for 15 years. He came to Chicago in 1882 to start the banking firm of N. W. Harris & Company, taking a gamble with his life savings. Seven years later, the newly named Harris Bank had $2 million in assets and a satellite office in New York. 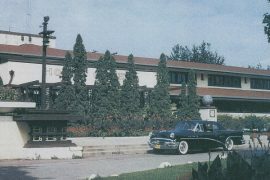 Almost twenty years later, Harris incorporated the firm as Harris Trust & Savings Bank and completed his summer home in Lake Geneva. Not bad for an insurance salesman from Ohio. But Harris’s life was not always easy. He lost two wives and one child before meeting his third spouse, Emma Gale, who lived at Geneva Lake with him. His first wife died after bearing three children (one of which died in infancy). His second wife, Clara, died when she was only 22. They were married less than a year. As the success of Harris Bank grew, its founder did not waste money on cocktail parties or lavish entertainment. Instead, Harris put his name on practically every major institution in Chicago. To start, he gave the Field Museum $250,000 to establish a public school extension that would bring the study of natural history to students throughout the city. To this day, the N. W. Harris Learning Collection remains a vibrant part of the museum. Harris also became a founding member of Northwestern University, where he donated the money to build Harris Hall, which is still at the heart of campus. At the University of Chicago, he endowed the Institute of Politics in 1924 and funded explorations in Egypt. He knew Hutchinson, Ryerson, and Bartlett from their mutual efforts at the University of Chicago. Harris rounded out his charitable efforts with active support of the YMCA, Wesley Memorial Hospital (which now houses the Harris School for Nurses), Saint James Methodist Church, Mount Holyoke College for Women, and the Chicago Community Trust. The latter organization, founded by Harris the year before his death, had more than $2 billion in assets as of 2015. In fact, nearly every institution that Harris supported in the early 1900s is still thriving today. It is impossible to discuss the early years of Snake Road without mentioning one final name: Simeon B. Chapin. He owned Flowerside Inn, a beautiful lakeside estate immediately next door to Norman Harris. Chapin and Harris both operated in the world of finance, but business took them in different directions. Chapin was a titan of the New York Stock Exchange and Harris was based in Chicago. Yet, Lake Geneva made them neighbors. Chapin’s family migrated all the way from New York to Wisconsin every summer for more than fifty years because, quite frankly, no other lake would do. A Wisconsin farmer at heart, the Milwaukee-born Chapin expanded his Lake Geneva estate all the way to Lake Como to make room for several farms. He was a hard worker and didn’t mind the extra hours needed to manage the land. When he was 17, Chapin’s father died suddenly — leaving the family in terrible debt. Chapin moved to Kansas City, where his uncle ran a profitable business, and sent money home to support his mother. The following year, he moved to Chicago and operated the family business from there. The debt was still crippling, but he had steady work. A decade later, Chapin was a new man. In 1892, he met and married Elizabeth Maddocks, with whom he would have four children. The same year, he began his own brokerage business, S. B. Chapin & Co., which went down in history as the second-oldest firm on the Chicago Stock Exchange. A few years later, the Chapins started to build their Lake Geneva “cottage.” Chapin’s thriving business took the family to New York, but Flowerside Inn remained their summer retreat. Chapin felt deeply tied to the Lake Geneva community. In 1920, he founded the Water Safety Patrol. He also donated the land for Horticultural Hall, joined the Geneva Lake Civic Association, and became an officer of the Lake Geneva Historical Society. He took a special interest in the Lake Geneva YMCA and its summer camp. In fact, he personally paid staff salaries at the YMCA in difficult years. His wife, Elizabeth, was active in the Lake Geneva Fresh Air Association, which founded Holiday Home. In 1928, Chapin performed an unusual deed for the Lake Geneva community: he organized an archaeological survey of lakes Delavan, Como, and Geneva. Working with the Wisconsin Archaeological Society, he hired experts to survey the land, create records of Potawatomi campsites, and excavate Indian burials. Without Chapin’s contributions, key historical information would have been lost. After Chapin’s death in 1945, his family continued to live in Lake Geneva for many years. His grandson, Harry, resided on the original property along Snake Road until his death in 2013. Harry was active in the Chapin Foundation, which still serves the Geneva Lakes area, but mostly he wanted to raise chickens. As Simeon B. Chapin once advised him, there’s nothing wrong with Wisconsin and farming. Who knew that Snake Road — a quiet, 2.5 mile stretch of road — could bring together such monumental figures? 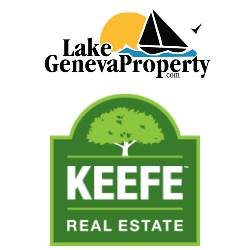 The historic residents of Snake Road were responsible for founding or establishing many institutions that are still essential to the Lake Geneva area community today. Many of the women who called Snake Road home were active in the suffrage movement, even holding meetings at their Lake Geneva residences. In Illinois, these families helped to create things like the University of Chicago, the Field Museum, Hull-House, and the Art Institute. These were people who did not rest on the laurels of their wealth and achievement. They were legendary philanthropists who dedicated their lives to making better communities.